Well...I pulled the rip cord on my Clash Maniac game this past weekend and took him to BH5. The upgrade finished yesterday and I set about getting the new level developing. I took the two days of BH upgrading to fill my storages. My goal was simple - I wanted to be able to drop everything new, right away, and focus on getting the Battle Machine (BM). The BM is great as a tank for other troops and running the "sprint for the BH" strategy. Day 1 of the new level - everything dropped. I had to wait for one more set of attacks to put down the MultiMortar, but it was only a matter of hours so I went back and dropped that in the evening. My standard, diamond-design base for BH5 went down as well. 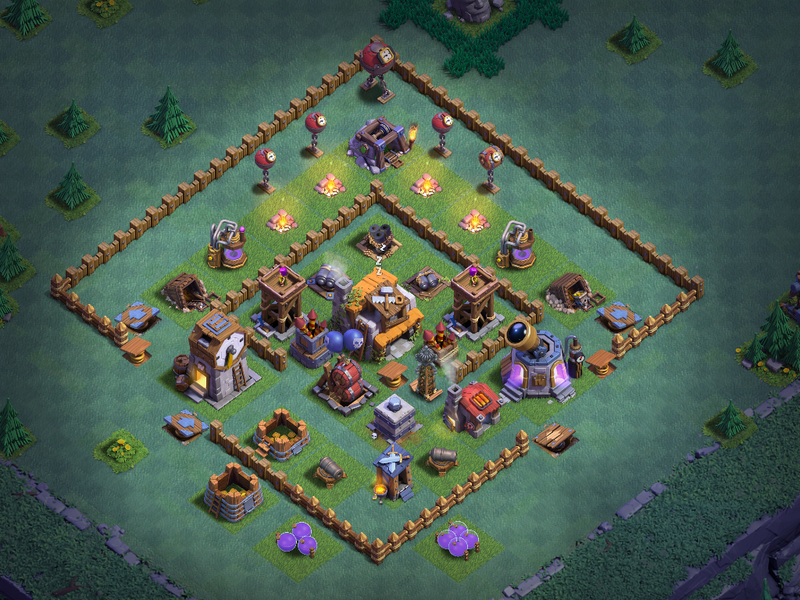 Initially, I had the gold storages where the MultiMortar and BM sit; one has since been moved. I am just a couple hundred thousand in elixir from getting the BM, so the base should be complete by the end of the second day. That will mean I will have a fully deployed BH5 game - with all level 8 troops and the BM - within two days of completing the BH4->BH5 upgrade. This is a very solid start to BH5 and I anticipate this game will be in the 2500 range in a week or two, just like the other BH5 games I'm running. Success as an early BH5 relies heavily upon the right starting layout and upgrades. A lot of players get on the forums and complain about the BH6 match-ups, and even being matched against near-max BH5s. The truth is that you can take these opponents on just fine if you're smart about how you handle the opening of BH5. Yesterday's focus was on storages; can't do the BM repair without upgrading elixir storages. Today (Day 2) I am working on the little upgrades - things like resource collectors, traps, mines, and other low-cost upgrades - while I wait for my next attack run to come available. As soon as the BM repair finishes, I'll begin upgrading main structures - Star Laboratory, FireCrackers, MultiMortar, Double Cannon - until everything is level 4. The lab is first following the BM because I need to get Beta Minions and Baby Dragons to level 10. (As always - offense first.) Since the meta for BH5 and BH6 players is air, air, air, I'll be upgrading my second FireCrackers quickly. Likewise, the best opening defense against the BM are the MultiMortar and the Double Cannon, so they rank high as well. Although the Crusher is a domineering defense, the difference between level 4 and level 5 is relatively minor. I'll only repair the BM; not upgrade it. The reason - I need that elixir for other troops to be upgraded. Once I have Beta Minions and Baby Dragons to level 10, I might consider upgrading the BM a level or two but even then I prefer to focus on the other troops first. My normal upgrade path for troops at BH5 goes Beta Minions -> Baby Dragons -> Boxer Giants -> Sneaky Archers -> Raged Barbarians -> Bomber -> Battle Machine. Sometimes I switch the Sneaky Archers and Raged Barbarians, and I don't even bother with the Cannon Cart because it's useless right now; that can wait until BH6. There's an ongoing debate around BH5's position in the trophy rankings (BH4 as well, for that matter). I steadfastly maintain that there are sweet spots in the trophy rankings for each BH level. An active BH3 player can get up to 800-1000 trophies, laying the groundwork for the rest of the game. BH4 runs 1000-1800 trophies with a near-max+ BH4 hanging around 1600-1800 trophies without pushing (just the daily 3 lootable attacks). BH5 will pick up around 1800 trophies and can comfortably maintain between 2500-2700 cups. Right now, the ClashManiac game is sitting at 1884 trophies as a brand new BH5; exactly where it should be, considering that is the top end for a BH4. As I follow the above stated upgrade path, I expect to top 2000 trophies in just a few days then hit the 2500ish mark in another week or so. This will all be without doing any trophy pushing at all; it's a natural progression that works well for each base level. Movement up the trophy rankings is important because it is tied to loot bonus. Right now, at 1884 trophies, I will gain 270K each day in gold and elixir. Once I reach 2400 trophies, it will be 330K. That 60K difference makes a difference because it impacts how long it takes to save up for the higher cost upgrades associated with BH5. However, max daily loot at 3000 cups is 400K; although it's just a big a difference, it does not have nearly the impact to gameplay as getting into the BH5 sweet spot of 2500-2700 trophies although you would have to put in a lot more time and effort to get there. This is why I just hang out at 2500-2700; it's a perfect range that provides just what is needed for BH5. I say this from experience - my other BH5 games, all of which are nearing max, have been sitting in this range for the better part of a month and pull down 330K-350K each day on just their 3 daily lootable attacks. I expect to spend about a month and a half at BH5 before making the jump to BH6. Again, I'll max most things to ensure a solid baseline for BH6 especially the troops. 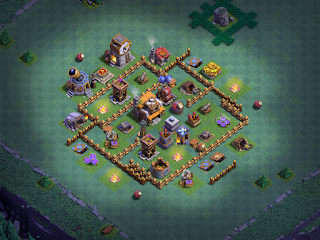 Level 10 troops are a solid way to maintain at BH5 and they provide ample firepower against most BH6 games you'll find in the 2500-3500 trophy range. Trophy pushing to the top ranks is really something that should be reserved for late BH6 players. There's no "financial" benefit as loot bonus stops increasing at the 3000 trophy mark and, to be honest, it's just frustrating and time consuming. My most advanced BH5 game (Nachtherr) is currently upgrading the Crusher to level 5, then comes the MultiMortar, and lastly the Guard Post. All of the traps, storages, other point and splash defenses...they're all level 5 in just over a month. All troops are level 10 except the Bomber, which will be there in a few days. The Battle Machine is just now level 2 and will be the focus, side-by-side with the Bomber, over the next week just as soon as the MultiMortar is done. This is, of course, the same path the ClashManiac game is heading down and largely the same as my other BH5 games (Psyberon and KussVonNacht). I've reached a point that the BM at level 5 would actually be useful; the BH6 games I'm facing are sufficiently developed that I'm getting a LOT of match endings where the BH itself has just a sliver of health and a level 5 BM would have gotten me past the finish line. Meta change or matchmaker...I'm not sure. ClashManiac will be the test for this one though - if I start seeing the same there, I'll adjust the upgrade path to just do Beta Minions and Baby Dragons then jump straight to the Battle Machine before working on the other troops. For now, though, I'll stay the course. Knowing that I am an avid rusher, you might ask - why aren't all of these games BH6 yet? I've found that a more conservative rush makes the BB game easier and more fun. I did the fast rush on my main game but it just wasn't as much fun. There's nothing wrong with it, and lots of players are doing the hyper-rush thing. I just recommend playing more conservatively and with a bit more patience as it really makes it easier to play casually. Now, if you're a diehard and got just the one game - rush like a mad man.